4 years in total (AFJROTC Coffee County Central HS in Manchester, TN). First year teaching at THS. 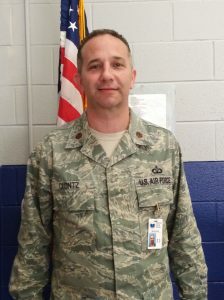 Served 27 years active duty Air Force. Throughout that time I was an Air Traffic Controller, and later commanded airfield operations. I also had the opportunity to teach USAF air Traffic Control Technical Training School, Air Field Operations Officer Course, and at the USAF Squadron Officer College. My wife Lisa and i have been married for 24 years. I have two daughters, Samantha and Sierra, and one son, Alex. Sierra, the youngest, graduated college this year (2018). Samantha and Alex live in Marion, NC and college station, TX respectively. I aslo have two “ankle biter” dogs, Bob and Layla. I am from Marion, NC- just on the other side of Black Mountain and i lived there up until i headed off to the Air force right after high school. I absolutely love the BEACH but absolutely hate the SAND!